Loretto Cattell, M.Sc, CNHC Registered Aromatherapist, M.I.F.P.A. Following a long career in midwifery and nursing, Loretto trained as an Aromatherapist at the Shirley Price International College of Aromatherapy and qualified in 2000. Loretto specialises in the care of people affected by cancer, and practises at the Cancer Support Centre in Sutton Coldfield. 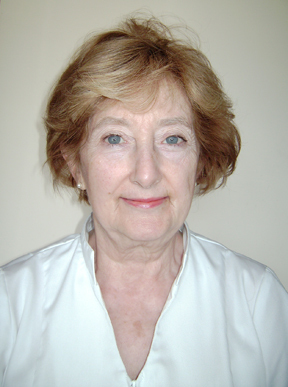 She holds a Postgraduate Diploma in Complementary Therapies in Cancer Care, and in order to enhance the care that she provides Loretto has undertaken additional courses in Vodder Manual Lymph Drainage, Reiki, Quantum Touch, Indian Head Massage and Emotional Freedom Techniques (EFT). In 2013 Loretto qualified as an Aromatologist and was awarded the Licentiate Diploma in Clinical Aromatherapy by the Penny Price Aromatherapy Academy. Learning the “M” Technique® has enabled Loretto to bring the benefits of touch to people too fragile to receive massage, and to teach the Technique to colleagues at the Cancer Support Centre. Loretto has introduced the “M” Technique® into the therapies she uses with children with special needs at the Wilson Stuart School in Erdington, Birmingham and has shown parents how to use aspects of the technique with their children. As an Approved “M” Technique® Instructor Loretto teaches the Practitioner Course twice a year in Birmingham and on-site at hospitals and hospices in the Midlands and North of England. The “M” Hands and Feet course is available for hospices, hospitals and carer groups on request. Loretto is one of only two Instructors in the UK approved to teach the “M” Technique® Trainer Course which brings this calming, relaxing and easy-to-learn technique to a wider audience, so that more people can enjoy the benefits of caring touch.